8. What is Agile Development? Agile development methodologies are used by cutting edge software companies and this is why. So now you're familiar with how engineers approach complex problems. You've also got an appreciation for why engineering encompasses not just the product you're building but also the process for building it. How are engineering processes implemented in the real world to manage software development projects? Because you're going to either work as part of a team on a larger project or manage a team of your own, it makes sense to understand how this choreography comes together. In this lesson, we'll walk through two broad philosophies of project management, Waterfall and Agile, before diving deeper into the Agile Development process and the tools it uses in the following lessons. By the end of this section, you'll be able to apply an Agile process to your own projects and workflows. When you've got large teams of people trying to solve even larger problems, you naturally need some sort of structure to make sure you're all heading in the right direction. Have you ever been a part of a team that lacked strong structure or a process that wasn't well-defined? Imagine that occurring when there are millions of dollars and possibly even lives at stake! The discipline of "Project Management" evolved to formalize the best practices of managing complex projects, particularly around the organization and allocation of time and resources. There are many different approaches to project management including Lean, Iterative, Incremental and Phased. Though they each have their own creative flowcharts and diagrams and specific implementations, all these approaches follow approximately those same four steps in some fashion or another. For software project management, the two approaches we'll cover below are Waterfall and Agile. Requirements Specification (or Understanding the Problem). Here you figure out all the details of the project and produce the "Product Requirements Document", which contains everything you need to fulfill. Design (or Planning your Solution). Here you figure out the architecture of the software you'll be building. Construction/Implementation (or Executing your Solution). Build the software. Testing (or Verifying your Results). Make darn sure the thing works before shipping it. Installation. Install the product with the customer or end user. Maintenance. Address issues that arise from actual use. You may have noticed that there are a few extra phases at the end. In the real world, once you've created a software product, there are additional practical stages, like installation and maintenace, that aren't really covered in the 4-step approach. The process is designed to make really sure that you're building a functional product. It's a legacy of hardware construction, where it's very costly to change things after the fact. When software engineering was getting started, software was shipped out on physical disks that had to be updated manually so it was reasonable to adopt that kind of process. 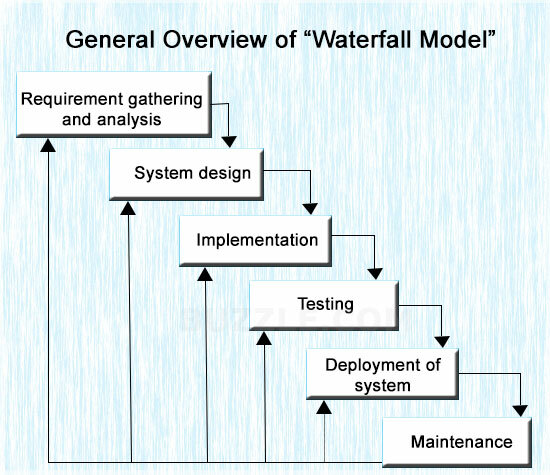 In general, the waterfall "Big Design Up Front (BDUF)" model is most effective for projects with high barriers to future change or serious safety or reliability needs (e.g. space programs or critical health software). Waterfall follows some good engineering theory as well -- you learned before that a bug caught early is worth much more than one caught late. You've been relentlessly pushed to think and plan first. Why isn't waterfall still in favor? Unfortunately, the process is extremely long, bureaucratic and costly. It assumes that you know what you're going to build from the beginning and can spend long periods of time building it (often 12- or 18-month cycles). By assuming they know everything up front about the customer, engineers ended up building all kinds of features that never got used. (Most features you build will never get traction with users. Sorry if that's a shock). Companies developing consumer-facing software found that they were having trouble keeping up with the market given these constraints and needed something more. So Agile is about more than just creating a nimbler planning process for a particular software project: it provides a whole philosophy for organizing teams and working with clients. It specifically advocates constantly working with customers during the development process to keep up with changing requirements, which should feel familiar from our User-Centered Design lessons in the Design mini-course. Agile teams operate in ways that promote collaboration and adaptiveness, including co-location and pair programming. A notable piece that's missing is the massive specification document produced early in the waterfall process. Agile also advocates very short cycles, often only 1-2 weeks at a time, before the software is shipped. That software is usually deployed to users as soon as possible, which is obviously highly project-dependent, and feedback is collected in real time to help adjust the priorities for the coming iterations. You might have noticed that Agile also meshes really well with the prevailing Lean Startup philosophy, which advocates shipping the simplest functional version of your product to customers ASAP. Keeping cycle times short has all kinds of advantages: better responsiveness with clients, quicker feedback from users and happier engineers who get to frequently ship meaningful software (woohoo!!!). So why did it take so long to "go Agile"? The advance of Agile methodologies has been undoubtedly supported and accelerated by the invention and growth of cloud-based software. Deploying your code to "the cloud" instead of having users install it directly onto their machines makes it MUCH easier to update software for all your users (essentially just a button click). Without that option, it would be much more difficult to adapt to change as quickly as Agile requires. It's important to note that, though Waterfall was (and is) heavily implemented, it wasn't the only project management technique to be used by the software industry prior to Agile and it won't be the last. We've obviously simplified things here and we don't want to give you the impression that the world was all Waterfall prior to 2001 and all Agile after. In fact, you'll see in the next lesson that XP was around before the Agile Manifesto was ever released and it's based on practices that were started in the 1960s. You should have a good sense of the general principles of the Agile process and how they differ from those of the Waterfall process which was dominant in the past. In the next lesson, you'll learn about two specific ways that Agile is implemented in the real world: eXtreme Programming (XP) and SCRUM.